A career-best 159 not out from Dawid Malan led Middlesex from a precarious position to a stance of authority against Nottinghamshire after day one at Trent Bridge. Malan made his 13th first-class century – beating a previous four-day best of 156* against Cambridge MCCU – as he and James Harris guided the visitors from 165/7 to 312/7 by the close of play. 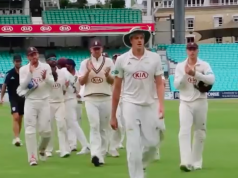 After winning the toss, Nottinghamshire had started on the front foot with Luke Wood bowling Australian Joe Burns with just the fourteenth ball of the match with some cloud cover to give the bowlers some assistance in the Midlands. That wasn’t the only early success for the hosts, with Burns’ fellow opener Sam Robson trapped leg before by Jake Ball for 15, leaving Middlesex wobbling at 25 for two. Regular wickets disrupted the rhythm of Middlesex’s innings, with only Malan making more than 19 from the top order. He and Nick Compton had looked to be settling following the early setbacks, but when the former was caught behind off Brett Hutton, the game was intriguingly set at 63/3. 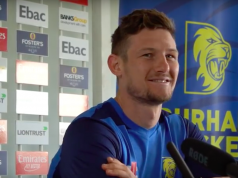 Captain Eoin Morgan was also caught behind, this time off Wood, and once James Franklin, John Simpson and Ollie Rayner all departed for single-figure scores, the chance to gain precious batting points appeared to diminish quickly. Malan, however, soldiered on. Out of 165/7 from Rayner’s dismissal, the 27-year-old had 90, soon bringing up his century from 143 balls with 16 boundaries – stark contrast to those who had gone before him. In James Harris, Malan eventually found a willing counterpart. Coming in at number nine with an average of just over 20, Harris provided perhaps the surprising partner, but a much-needed one for Malan to progress. Starting slowly, Harris began with nine from 30 balls before opening up to stroke ten boundaries in his 68*. Harris will resume in the morning, with his career best 87* in sight. Malan, meanwhile, will be eyeing up the 16 overs remaining to accrue further batting points.